After a series of meetings between the Icelandic Meteorological Office, the University of Iceland, and Iceland Geosurvey, the Iceland Department of Civil Protection and Emergency Management stated on 13 July that Öræfajökull has shown clear signs of unrest for at least the past year and a half. The report noted ongoing inflation and increased seismicity, despite a decrease in geothermal activity since December 2017. The volume change since the beginning of the unrest was about 10 million cubic meters, likely from an injection of new magma. On 4 May, the Icelandic Met Office reduced the Aviation Color Code at Öræfajökull from Yellow to Green due to signs of reduced activity. Since September 2017 there has been less earthquake activity, stable hydrological and geochemical measurements, and reduced geothermal heat output. There has been possible minor ongoing inflation, but no signs of an imminent eruption. On 22 December IMO reported that activity at Öræfajökull had been fairly stable during the previous weeks, though still above background levels; the Aviation Color Code remained at Yellow. In December the largest earthquake detected was a M2.5, but most events were smaller than M1. Earthquakes were located close to the caldera at depths between 2 and 10 km. The Icelandic Meteorological Office (IMO) reported that on 17 November the Aviation Color Code for Öræfajökull was raised to Yellow because satellite images and photos showed that a new ice cauldron had formed within the caldera the previous week. The new cauldron was about 1 km in diameter and 15-20 m deep, and signified a recent increase in geothermal activity. Scientists conducted an overflight on 18 November; in addition, while on the ground, they took water samples, measurements of electrical conductivity, and gas levels at the Kvíárjökull outlet-glacier, a valley glacier on the SE flank of Öræfajökull. There was no obvious sign of flooding in the Kvíá river. A sulfur odor, which had been reported for about a week, was also noted. An increase in the seismic activity was recorded for the last few months (the largest earthquake, an M 3.4, occurred on the 3 October), but was low for the past few days. IMO noted that there were no signs of an imminent volcanic eruption, though there was considerable uncertainty about how the situation will evolve. The Global Volcanism Program has no Bulletin Reports available for Öraefajökull. Öraefajökull, Iceland's highest peak, is a broad glacier-clad central volcano at the SE end of the Vatnajökull icecap. A 4 x 5 km subglacial caldera truncates the summit of the dominantly basaltic and rhyolitic volcano. The extensive summit icecap is drained through deep glacial valleys dissecting the SW-to-SE flanks. It is the largest-volume volcano in Iceland, and was mostly constructed during Pleistocene glacial and interglacial periods. Holocene activity has been dominated by explosive summit eruptions, although flank lava effusions have also occurred. A major silicic eruption in 1362 CE was Iceland's largest historical explosive eruption. It and another eruption during 1727-28 were accompanied by major jökulhlaups (glacier outburst floods) that caused property damage and fatalities. Selbekk R S, Tronnes R G, 2007. The 1362 AD Oraefajokull eruption, Iceland: petrology and geochemistry of large-volume homogeneous rhyolite. J. Volcanol. Geotherm. Res., 160: 42-58. Sharma K, Self S, Blake S, Thordarson T, Larsen G, 2008. The AD Oraefajokull eruption, S.E. Iceland: physical volcanology and volatile release. J. Volcanol. Geotherm. Res., 178: 719-739. Stevenson J A, McGarvie D W, Smellie J L, Gilbert J S, 2006. Subglacial and ice-contact volcanism at the Oraefajokull stratovolcano, Iceland. Bull Volcanol, 68: 737-752. Thorarinsson S, 1958. The Oraefajokull eruption of 1362. Acta Nat Islandica, 2: 1-102. There is no Deformation History data available for Öraefajökull. There is no Emissions History data available for Öraefajökull. 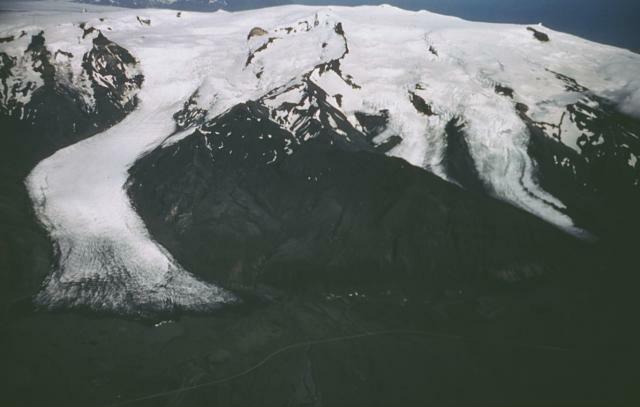 Öræfajökull, Iceland's highest peak, is viewed here from the west, with the Svinafellsjökull glacier (left) descending from the central icecap nearly to the coastal road. A 4 x 5 km subglacial caldera truncates the summit, which rises to 2119 m about 10 km NW of the Atlantic Ocean shoreline. A major silicic eruption in 1362 was the largest in Iceland during historical time. It and another eruption during 1727-28 were accompanied by major jökulhlaups (glacier outburst floods) that caused property damage and fatalities. Photo by Oddur Sigurdsson, 1986, (Orkustofnon, Icelandic National Energy Authority). The Global Volcanism Program has no maps available for Öraefajökull. Catalogue of Icelandic Volcanoes (Link to Öraefajökull) The Catalogue of Icelandic Volcanoes is an interactive, web-based tool, containing information on volcanic systems that belong to the active volcanic zones of Iceland. It is a collaboration of the Icelandic Meteorological Office (the state volcano observatory), the Institute of Earth Sciences at the University of Iceland, and the Civil Protection Department of the National Commissioner of the Iceland Police, with contributions from a large number of specialists in Iceland and elsewhere. This official publication is intended to serve as an accurate and up-to-date source of information about active volcanoes in Iceland and their characteristics. The Catalogue forms a part of an integrated volcanic risk assessment project in Iceland GOSVÁ (commenced in 2012), as well as being part of the effort of FUTUREVOLC (2012-2016) on establishing an Icelandic volcano supersite. Large Eruptions of Öraefajökull Information about large Quaternary eruptions (VEI >= 4) is cataloged in the Large Magnitude Explosive Volcanic Eruptions (LaMEVE) database of the Volcano Global Risk Identification and Analysis Project (VOGRIPA).